The Vineyard Wine Market respects and protects the privacy of our customers and those who use our website. The following Privacy Statement provides details about how your personal information is collected and used. This privacy statement applies to The Vineyard Wine Market website, along with the products and services that are located in, but not limited to, thevineyardwinemarket.com domain. The Vineyard Wine Market is the sole owner of information collected on this site. We will not sell, share, or rent this information to others in ways different from what is disclosed in this statement. The Vineyard Wine Market collects information from our users at several different points on our website. Our website offers several opportunities for visitors to register for promotional and informational mailings, wine tasting events and resources, and for our exclusive wine club. These registration forms are often linked to Constant Contact’s mailing lists and require users to give contact information (such as name and email address). We use this contact information to send users information about our company and its products and services if requested or necessary. Users may opt-out of receiving future mailings at any time (see the choice/opt-out section below). The Vineyard Wine Market provides links to third-party websites, such as those of our business partners and online advertisers. While on these sites, The Vineyard Wine Market or its partners may collect information about you. Because The Vineyard Wine Market does not control the information policies or practices of these third parties, you should review their privacy policies to learn more about how they collect and use personally identifiable information. The Vineyard Wine Market’s mailing list is controlled by Constant Contact which provides users the opportunity to opt-in, opt-out or change preferences via a link in the footer of most email messages. These options are made available when you sign-up for our email lists and in email messages delivered from our company. 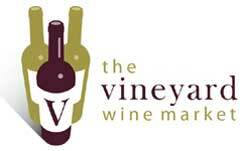 Alternatively, you may email us at info@thevineyardwinemarket.com.